You are here: Home / Blogs / From One Blackboard to Computers. From One Blackboard to Computers. It was only in the early 60s that secular modern education of the Bhutanese began; in a small room located at a watermill at the base of Trongsa Dzong. There was just one teacher and just one blackboard. Until then, monastic education was the only form of education accessible to the Bhutanese. That too was limited to only those wishing to become monks and nuns. It was only in the late 50s and early 60s that western education was introduced in Bhutan. 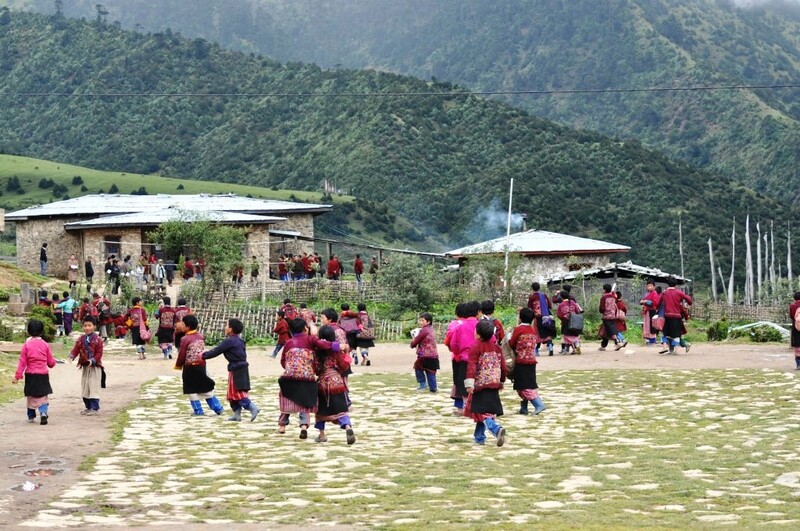 The Bhutanese government supported private schools to be established and about 11 schools in the main district towns across the country opened its doors to the public. The schools had an enrolment of about 400 students then. But, there still was a major hurdle. These schools provided education only at the primary level. For secondary and tertiary education, the Bhutanese would have to go to India or overseas. Soon, due to low enrolment numbers and lack of teachers, most of the private schools shut shop. The few that were still running were taken over by the government to improve and raise the quality of education. Only in the First Five Year Plan – during the reign of the Third Druk Gyalpo (King) – did the Bhutanese education sector significantly expand. More than a hundred schools were established and more than 15,000 students enrolled. In the relatively short time that has elapsed since its introduction, the education sector has achieved much progress. By 2010, there were more than 650 schools spread across the Kingdom with a total number of 180,405thousand students studying in those schools. Educating those students were a total teacher force of 8,067.In addition, there were over 13,000 students registered in the non-formal education sector and vocational training schools. While it is apparent that the education sector has expanded significantly in terms of quantity, concerns on whether the quality of education has kept up began being raised. A recent study conducted by the Royal Education Council confirmed that the education quality was indeed deteriorating. In a disappointment for the education system, the study showed that products of a Bhutanese education system lacked basic analytical and communication skills and lacked the attitude needed as entry level professionals. Other problems highlighted were that teaching was mostly a one-way affair and students were performing below expectations of their grades. Teachers in Bhutan simply convey what is contained in textbooks without students being able to comprehend and demonstrate their learning, the study found. ‘Inquiry and application’ were important aspects of learning, absent in students as a result of poor curriculum design. Another major factor that could increase student and teacher performance that of making schools accountable based on results did not exist, the study said. And while it was understandable that schools lacked essential infrastructure because of funds and other resources constraints, better utilization can lead to a better learning environment, recommended the study. Many reasons why such problems existed were also identified. For one, it pointed out that the low academic and professional requirements for becoming a teacher prevented a move towards higher performance. And, that, there were insufficient programs to prepare potential candidates to become teachers. Coming to the classroom, it was further highlighted that teachers were under-prepared; there was a lack of appropriate curriculum resources, instructional leadership and in-service trainings. But while it was revealed that stakeholders in the education system were demanding change, the policy environment constrained innovation and initiative. Past reform attempts had been stifled because of lack of clear objectives and that a command, control and compliance mindset existed. However, innovation, quality learning and quality teaching did exist in certain schools. While it is known that private schools offer better education, some government schools also were able to meet standards that were beyond average. Continuous professional development and teacher learning resources must be provided to enable teachers to possess skills and tools to raise classroom teaching. The role of principals should also be heightened to make them into leaders. Providing and creating more autonomy, accountability, infrastructure and incentives is also recommended to enable schools to focus on their roles as institutions of teaching and learning. Lastly, the study recommends the education sector relentlessly focus on implementing such initiatives. Of late, the education ministry is putting much more emphasis on curriculum development and looking into other aspects that need improvement. Hopefully, with all problems plaguing the sector slowly but surely being rooted out, Bhutan will in the future see the establishment of a few fine International schools. 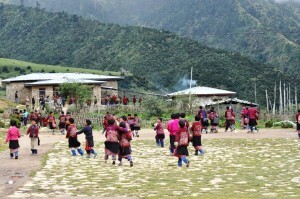 In the meantime, while modern education in Bhutan may have begun in a single room, with a single teacher, and one single blackboard, today, students and teachers are able to sit with computers – most of them with internet connection – and broaden the horizons and possibilities for the education sector in Bhutan. The poor quality of education has been acknowledged and is being addressed and that, in itself, should be an indicator that the education system in Bhutan is indeed healthy.